A team of researchers with members from Wuhan University and the University of Texas has created an artificial material that offers both negative refraction and no reflection. In their paper published in the journal Nature, the group describes their material, how it was made, and possible uses for it. Baile Zhang with Nanyang Technological University offers a News & Views piece on the work done by the team in the same journal issue. As most kids learn in school, when light rays strike a body of water, some are bent by the water, while others are reflected. Baile notes that in such situations, the incident and refracted rays wind up on opposite sides of the surface of the water—which opticians describe as the norm. He also notes that this is what happens with virtually all materials in nature. But he also notes that theory suggests that it should be possible to create materials that violate the norm. In this new effort, the researchers have created just such a material. 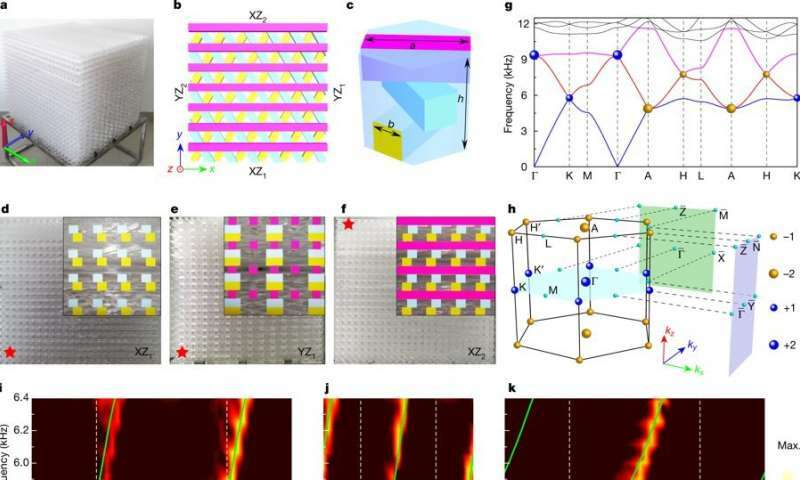 The researchers report that they made the new material by first studying the properties of a Weyl semimetal—a recently discovered quantum material that has interesting topological properties. To apply what they learned to a non-metal material, they created trilayer plates of phononic crystals using epoxy and other materials (shaped in a specific way). They then stacked the plates in twisted counterclockwise fashion by 2π/3 along the vertical axis. In so doing, they found that the resultant material not only exhibited negative refraction, but also absorbed all of the acoustic waves aimed at it, reflecting none. Baile suggests that the material could lay the groundwork for new developments in many areas—if a similar material can be created to behave the same way with optical waves, for example, that could lead to new types of optical systems. He notes that such a material could likely find many uses in acoustical systems as well, such as improved ultrasonic devices. He further notes that reflection-free materials could improve the efficiency of many current devices. Reflection and refraction of waves occur at the interface between two different media. These two fundamental interfacial wave phenomena form the basis of fabricating various wave components, such as optical lenses. Classical refraction—now referred to as positive refraction—causes the transmitted wave to appear on the opposite side of the interface normal compared to the incident wave. By contrast, negative refraction results in the transmitted wave emerging on the same side of the interface normal. It has been observed in artificial materials, following its theoretical prediction6, and has stimulated many applications including super-resolution imaging7. In general, reflection is inevitable during the refraction process, but this is often undesirable in designing wave functional devices. Here we report negative refraction of topological surface waves hosted by a Weyl phononic crystal—an acoustic analogue of the recently discovered Weyl semimetals. The interfaces at which this topological negative refraction occurs are one-dimensional edges separating different facets of the crystal. By tailoring the surface terminations of the Weyl phononic crystal, constant-frequency contours of surface acoustic waves can be designed to produce negative refraction at certain interfaces, while positive refraction is realized at different interfaces within the same sample. In contrast to the more familiar behaviour of waves at interfaces, unwanted reflection can be prevented in our crystal, owing to the open nature of the constant-frequency contours, which is a hallmark of the topologically protected surface states in Weyl crystals. "At 12:09pm on Oct 21 2024, Skynet becomes self-aware." If you can't explain the interaction as a summation of waves produced by a set of charges in an array; you don't know what'cha got!